Death. It’s not a fun topic. And when it comes right down to it, is anyone ever truly prepared to die? Philosophical debates aside, there’s one powerful step people can take to get their finances in order: investing in life insurance. For families with a mortgage, kids in college, or other hard-to-downsize expenses, not having enough life insurance to cover these costs can make a difficult time even harder. Despite this fact, 41% of Americans don’t have life insurance, and how much insurance people have varies widely from state to state. How does your state stack up when compared to the rest of the nation? That’s precisely what we set out to learn. TermLife2Go ranked each state by the average amount of life insurance coverage its residents had on the books as of 2016. First, we compiled the total face amount, or dollar value, of life insurance death benefits across each state. Then we divided that amount by U.S. Census Bureau population estimates to get the dollar amount of coverage per capita. The higher the resulting amount, the better the state ranks in our list. To make things more interesting, we also looked at how much coverage people bought in a single year (2016), median income, and how many insurance companies call each state home. There was a positive correlation between median income and life insurance coverage, meaning states with higher median incomes tended to have more life insurance, while lower-income states generally had less life insurance. This correlation seems like a natural explanation for life insurance trends, but it’s important to note that our findings don’t prove causation. How many companies sell insurance there, how people view life insurance, and other factors could have an effect as well. 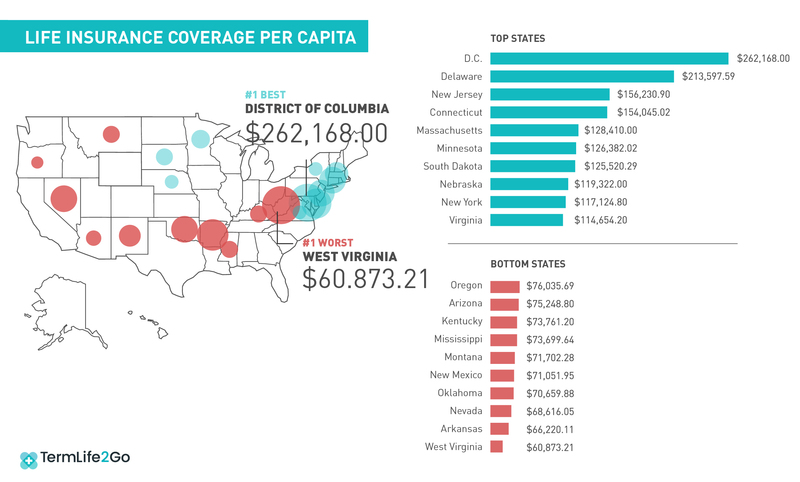 West Virginia residents are the least prepared to die, with $60,873.21 in life insurance coverage per capita. Per capita, DC residents own an average of $262,168 in life insurance coverage. The average Delawarean (ranked second on our list) owns $50,000 less! For those who bought the most life insurance in 2016 alone, Delaware and Washington, DC, were nearly neck and neck at $23,294 and $22,543 per capita, respectively. New Jersey came in third at $12,603. Outlier Alaska had the second-highest median income but ranks 34th in preparedness at $76,440 per capita. Alaska had no in-state life insurers in 2016. Other than Washington, DC, all five places without any in-state life insurers landed in the bottom half of our ranking. The correlation between median income and insurance coverage lines up with a study from Life Happens and LIMRA. Their 2018 Insurance Barometer Study shows that people with incomes under $50,000 are far more worried about monthly bills and their mortgage or rent than people with higher incomes. This correlation could mean that people who don’t buy life insurance just can’t afford it. But the study also discovered something else. While 63% of respondents said life insurance is too expensive, most people also overestimated how much life insurance costs—often by hundreds of dollars. 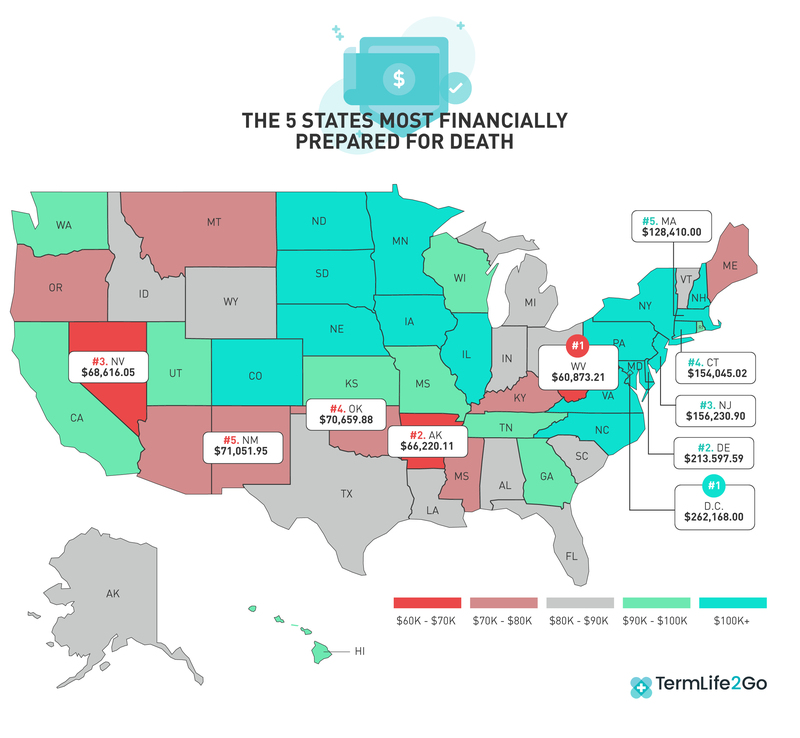 Would greater transparency and better-informed consumers lead to higher financial preparedness for death in your state? We’d sure like to find out. To that end, we’ve put together a library of resources. Check them out to learn if you could be better prepared for death, no matter where you live. Previous Post: How Much Does Life Insurance Cost?